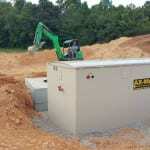 We will make sure that your project meets commercial septic tank installation regulations in Tampa, FL. At Southern Water & Soil, we offer one-of-a-kind commercial septic tank installations for businesses of all sizes. Since we have engineers on staff, we are able to design septic systems that have unique components to fit with your needs and the style and feel of your property. We will come to your place of business to determine the possible environmental needs, as well as whether the space will do better with an alternative or a gravity-fed system. From there, we will generate a proposal that includes all of the aspects of the system that you want. If you prefer to have a less hands-on approach, we can also make recommendations based on our knowledge and expertise with commercial septic tank installations in the area. Our service area includes Tampa, Florida, and some of the nearby cities. We frequently work with local health departments, so we have good relationships with those connections. This makes it much easier for our team to obtain permits and understand the regulations around septic systems in the location of your property. Because of the potentially dangerous situation with human waste, there are heavy restrictions around commercial septic tank installations. We will make sure that everything in your project meets these regulations to ensure a safe and positive outcome. Our team includes staff members with a lot of knowledge about septic systems, including a registered sanitarian, previous environmental specialist, professional engineer, and more. Each of these experts will use his or her experience to make sure that your septic system is strong, durable, and always operates correctly. At Southern Water and Soil, we offer commercial septic tank installation services in Tampa, Odessa, Lutz, Land O’ Lakes, Brandon, Orlando, Plant City, Dade City, Bartow, Lake Wales, and Lakeland, Florida.